A beautiful, moderate level trail run in the San Gabriel Mountains starting at Chantry Flats, off of Santa Anita Dr. in Arcadia CA. The 8 mile loop takes you past cabins, streams, waterfalls, wooded trails, chaparral, and extremely fun single track trail. Click on the map markers above for explanations, photos and video. Zoom in or out of the map using the +/- buttons, or double-clicking. You can re-position the map by clicking and dragging. Take the 210 West, exit Santa Anita Ave. and turn right. Continue on Santa Anita Ave. north (toward the mountains) until it becomes Chantry Flat Rd. Follow Chantry Flat Rd. for 2.5 miles until it dead-ends at Chantry Flat. Be sure to display your National Forest Adventure Pass on your rear view mirror if you are parking in the main lots or on the road leading to the trail head. Parking can be challenging as the day progresses, I recommend getting there before 7:30am for optimal parking options. A reserved parking lot is available (seasonally) for $10 per car. Take the 210 East, exit Santa Anita Ave. and turn left. Continue on Santa Anita Ave. north (toward the mountains) until it becomes Chantry Flat Rd. Follow Chantry Flat Rd. for 2.5 miles until it dead-ends at Chantry Flat. Be sure to display your National Forest Adventure Pass on your rear view mirror if you are parking in the main lots or on the road leading to the trail head. Parking can be challenging as the day progresses, I recommend getting there before 7:30am for optimal parking options. A reserved parking lot is available (seasonally) for $10 per car. Once you find parking, head to the main Recreation Area sign at the beginning of the parking lots (see photo). To your right will be two vaulted toilets, water fountains, and a bulletin board. Make sure you have enough water at the start, as refilling on the trail is not an option without water treatment equipment. This is a “pack-in, pack-out” trail, so make sure whatever you bring with you on the trail is brought out and properly disposed of when you’re finished. There are bear-proof trash cans next to the vaulted toilets and throughout the picnic areas. The route begins to the right of the toilets, either down the stone staircase or through the swinging car gate to the service road. You will descend that service road for 0.5 miles to the floor of Santa Anita Canyon where you will cross a footbridge that spans across the stream below. Across the footbridge there is an outhouse available in case you forgot to use the vaulted toilets at the start. Once you have crossed the footbridge, bear right up a slight incline on a wide, rocky trail. This trail will meander passed cabins on the canyon floor which pepper the hillsides that run along the creek. These cabins are really a unique part of the trail and have a lot of history behind them, which require a separate post altogether. There are plenty of opportunities for photographs along the creek, especially with early morning sun peeking through the trees and foliage. Around 1.3 miles into the trail you will see the Fern Lodge Junction trail sign on your right. This sign directs hikers to the base of Sturtevant falls (.5 miles from this point) and back to Chantry Flat (1 1/2 miles from this point). While the 1 mile round-trip detour to the base of Sturtevant Falls is not part of the loop course as described, if you feel like adding another mile to the run, it’s worth a visit at least once. Keep in mind that this is the most popular destination for hikers leaving Chantry Flat and often leads to congested trails and big crowds at the bottom. Be patient. Directly behind you from the Fern Lodge Junction sign is another trail sign for the Gabrieleno trail. You will bear right and take the Lower Trail to the top of Sturtevant Falls, then on to Spruce Grove Campground. From this point the trail will narrow significantly to a single track for a majority of the run. You will stay on this trail for awhile. Once past the top of Sturtevant Falls, you will reach the Falling Sign Junction. Turn right to stay on the Gabrieleno/Sturtevant Trail for another couple miles. You will traverse some moderately technical single track during this section of the run, crossing streams and hopping boulders along the way. Next you will encounter Spruce Grove Campground, which is a popular overnight camping spot during the weekends (especially during the summer months). There are outhouses available at the campsite, but no potable water. Continue on the Gabrieleno/Sturtevant trail through the campground until you reach the Newcomb Pass Trail Junction. The Newcomb Trail will be on the right side next to a red cabin, you will want to stay left on the Sturtevant Trail and cross the creek at this point. Bear left at the Upper Zion Trail Junction. This trail will start out with a steep section, but will level out shortly after thereafter. This is one of my very favorite segments of this run; the single track hugs the hillside, twisting and rolling through the changing vegetation. This is a great section to let loose, open up the stride a bit more, and run like a kid again! As you descend the single track from Mt. Zion Summit, the terrain becomes dry, deserty chaparral. Beware of Yucca along the trail which can harpoon a shin or thigh. During the summer months, this exposed trail is home to a variety of reptiles, including the Western Rattlesnake. As always in nature, be aware of your surroundings. I would recommend removing at least one headphone (if you run with music) during this section so you can hear a Rattlesnake before you see it, which is often too late. The Mt. Zion Trail drops out into the Winter Creek Junction. Veer right to Upper Winter Creek Trail. 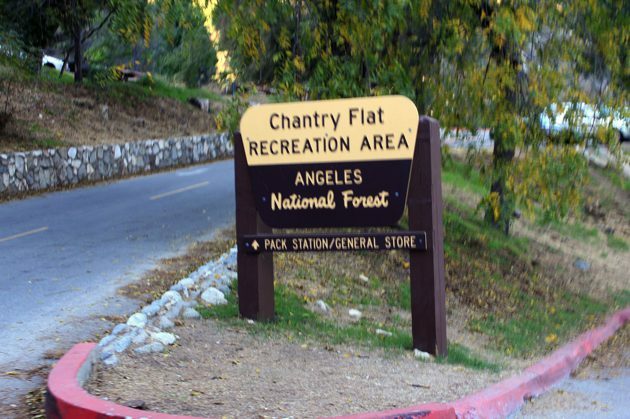 This trail will take you 3 miles back to Chantry Flat over rolling terrain. The Lower Winter Creek option is listed as 2 miles back to Chantry, and is downhill for the most part. However, Lower Winter Creek drops you off at the footbridge you crossed a half mile into the run, which means the last half mile is up the steep and strenuous service road. I prefer to run more distance and avoid climbing the service road, which is not only challenging but crowded. Follow signs on Upper Winter Creek Trail back to Chantry Flat. It should be about 3 miles from the Winter Creek Junction to the parking lots. Again, this trail is a rolling single track. It will likely have more foot traffic than you’ve seen since passing Sturtevant Falls, because of its proximity to the parking area. The trail ends at a service road above the parking area of Chantry Flat. You can either zig zag your way back to the parking area by following the service road, or cut through the picnic area. Congratulations, you’ve just completed the Santa Anita Canyon to Upper Winter Creek Loop! Carry enough water. Though the distance is only 8 miles, the terrain and elevation gain slows your pace considerably. Anticipate being on the trail for the amount of time it would take you to run 10-11 miles on the roads and plan accordingly. As always, when venturing into wilderness, it pays to be over-prepared than under-prepared – carry more water and nutrition than you think you’ll need. Cell reception is non-existent during this loop, so don’t plan on having access to online maps. If you care to, you can download the KML file from the Google Map above by clicking the share button (looks kind of like this: < ) and selecting “download KML”. You should be able to upload this to your own Garmin or Suunto GPS watches to have a reference point while on the trail. This file format may be compatible with other mapping services like MapMyRun or RunKeeper, which sometimes function offline or without reception. Get to the parking lots early! This place is super popular and parking is a hot commodity. I recommend getting to Chantry before 7:30am on weekends and 8:30am on weekdays. Get you’re Adventure Pass for parking the day before, so you don’t have to bother with it the day-of. I recommend getting an Annual Adventure Pass if you plan on venturing into the wilderness more than a handful of times per year. It pays for it’s self after 6 visits!